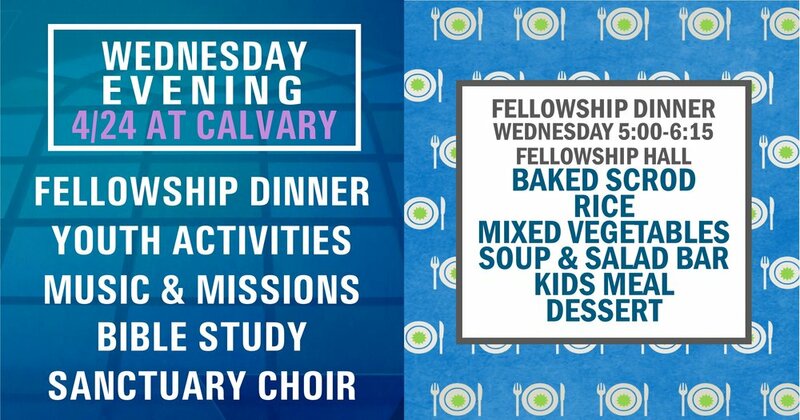 Spring break schedule Wednesday evening: No dinner, Bible studies or regular activities, with the exception of Sanctuary Choir practice which will take place at 6:30. College students are meeting at 6:30 at High Point to walk to Local Taco for dinner then taking in the 9:00pm FREE showing of “Spider-Man: Into the Spider-Verse” at the Gatton Student Center Cinema. 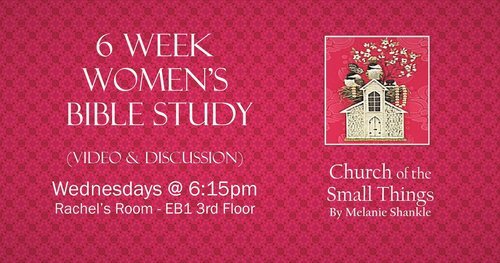 Come and bring a friend!! 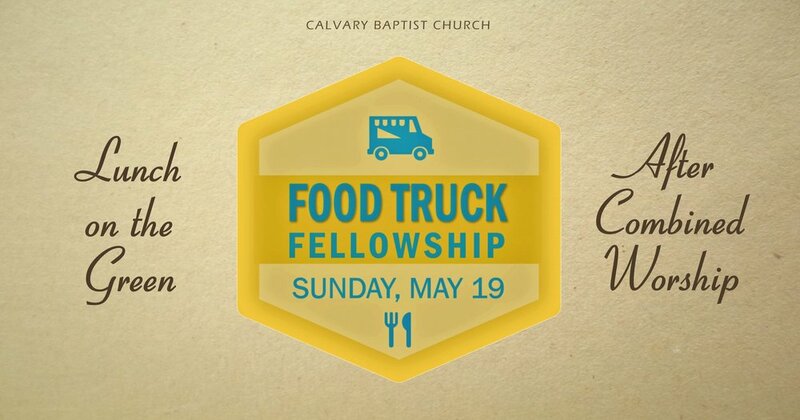 Revised Plan: Due to the cold, wet weather, we will have this event inside at the Calvary ROC. 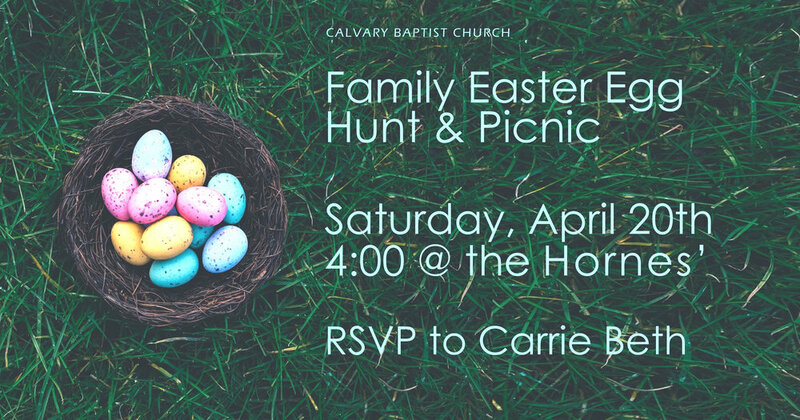 We’re having a Family Easter Egg Hunt & Picnic on Saturday, April 20th at 4:00pm at the Hornes’ home. The picnic will be a time for games, crafts, an egg hunt—and enjoying God’s beautiful world! Please email your RSVP to Carrie Beth ASAP so we may know how many to plan for and who to contact if it rains. Transition Team Update 3-31-19 (to be distributed in Sunday School folders on 3/31/19). To access the Congregational Assessment Tool (CAT), click here. We value your opinion and encourage you to participate in the CAT survey. Your answers will help leaders gauge the strength, vitality, and trends in our church. 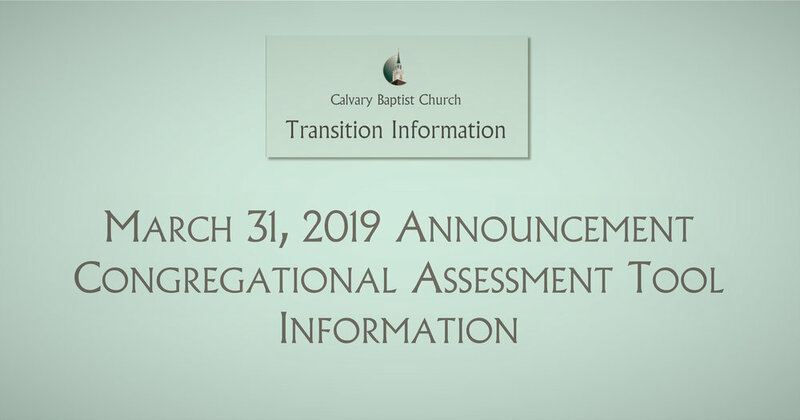 The information gained from this assessment will be valuable in helping the Pulpit Committee, Deacons, the Transition Team, and other leaders of Calvary Baptist Church as they make decisions about the future of our church, including decisions about the next Senior Pastor. You will receive an email soon inviting you to take the CAT survey. In the next few days you will get an email with a link to the online CAT. The link will be live on April 1, 2019 until April 30, 2019, 6:00 am. Click on the link provided in the email to take the survey. The CAT must be completed in one sitting, as you will not be able to exit and come back to finish it. Allow at least 30 minutes to complete the survey. Please do not discuss the survey or your answers with others. Discussions of the survey questions may influence the answers of others. All answers are strictly anonymous. We have no way of matching any assessment to a particular person, so feel free to candidly share your perceptions, opinions and experiences. Our future together is dependent on your participation and honest answers. Not sure you are on our email or address list? If you receive the Connections newsletter via email, you’re all set. 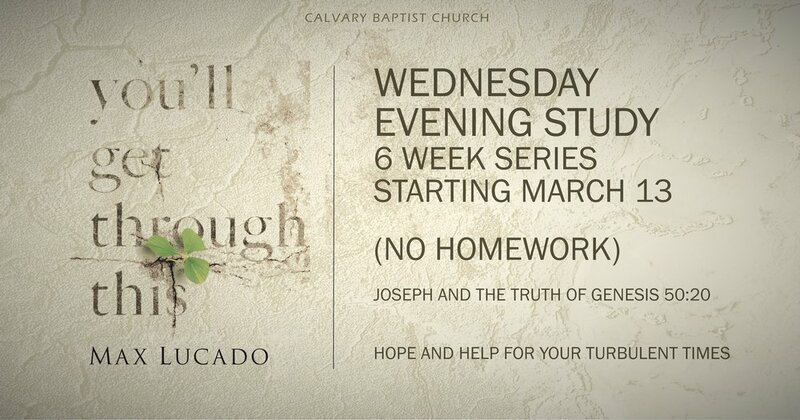 If not, send your name and email address to info@calvarybaptistchurch.com. To be added to the snail mail list, write your name/address on the back of this paper [printed Sunday School folder announcement]. 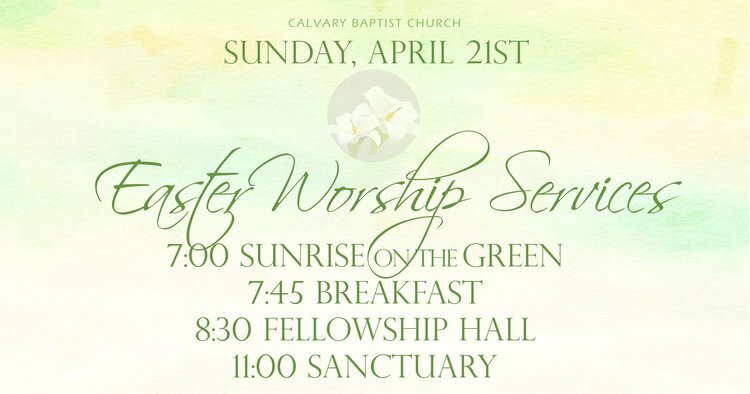 Coming in May – Calvary Listening Sessions. We want to hear from everyone! 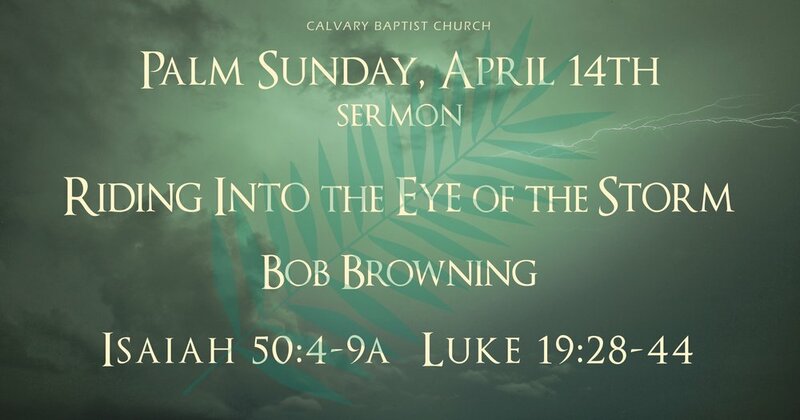 To visit the Calvary Transition Information page (click here). Worship with us at 8:30, 10:45 or 11:00 on the fourth Sunday of Lent. 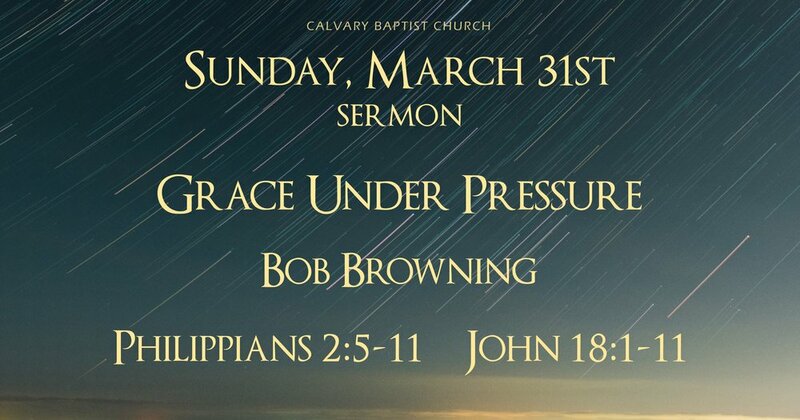 Bob Browning will share the sermon, “Grace Under Pressure” at the 8:30 & 11:00 services. Scripture readings this week are from Philippians 2:5-11 and John 18:1-11 . 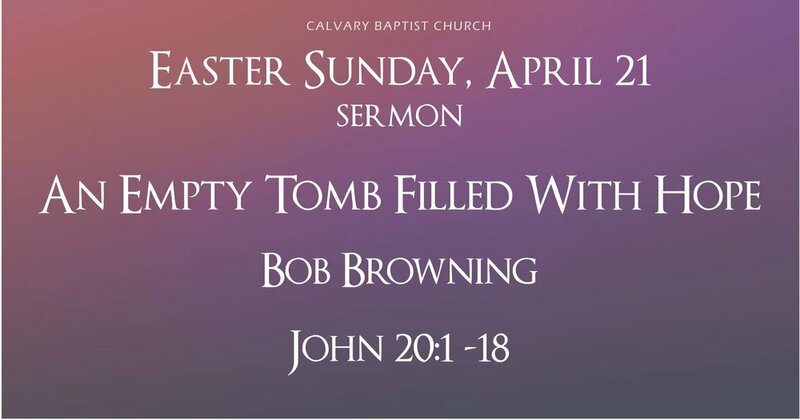 The 11:00 worship bulletin can be found here. Niki Hays continues the sermon series, “Journey to the Empty Tomb” in The Summit at 10:45 in the Fireside Room. College students, stay for lunch! 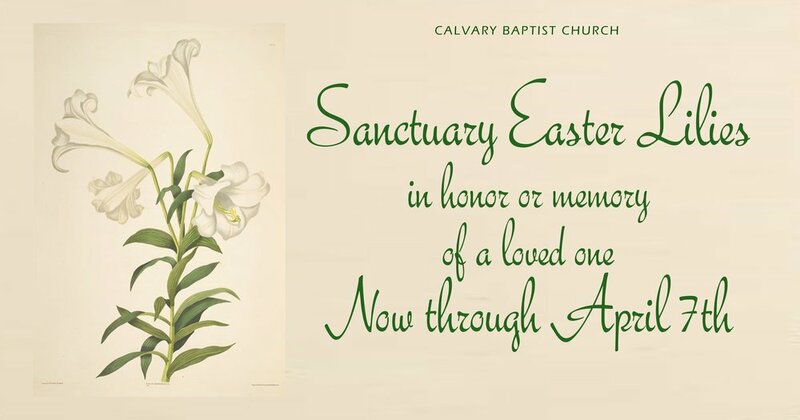 There is a New Christian Class at 9:45am (contact Carrie Beth for info), Reminder: Easter Lilies for the Sanctuary order envelopes are available. 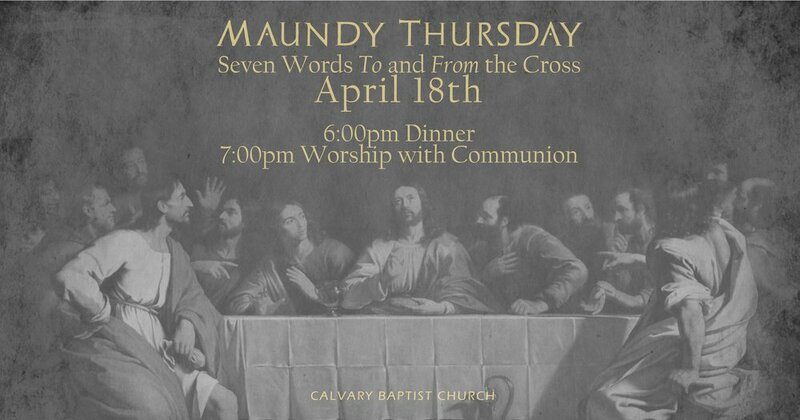 “Seven Words To and From the Cross"
Dinner begins at 6:00pm in Fellowship Hall followed by the worship service at 7:00pm in the Sanctuary. Information on Easter Sunday and other Easter events can be found here.